I went to school in Preston, Lancashire – Queen’s Drive Country Primary, Fulwood High (now Fulwood Academy) and WR Tuson College (now Preston College). After leaving school, the first stage in my academic career was an honours degree in English from Royal Holloway College, University of London. Royal Holloway College was originally a women-only college, and its university scarf is in the suffragette colours of green, white and purple. While I was there, I researched the life of an ex-student, Emily Wilding Davison, who died when she stepped in front of the king’s horse at the Derby as part of the campaign for votes for women. 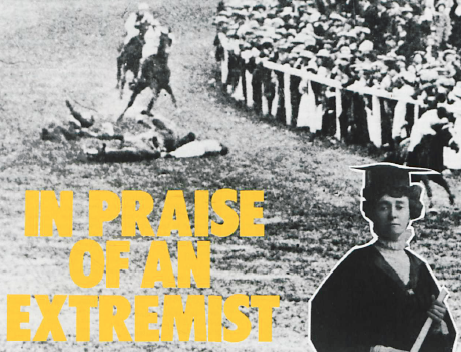 The article I wrote on her life, In Praise of an Extremist, was subsequently published in the feminist magazines Spare Rib (UK) and Broadsheet (NZ) and is now available online, thanks to JISC. A few years later, I completed a part-time Masters degree at Birkbeck College, University of London, in Early Modern history. My dissertation, on the Dissolution of the English Convents, was written online and saved on now-unreadable Amstrad computer disks – leaving only a couple of faintly printed versions surviving. This entry was posted on January 6, 2012, 2:31 pm and is filed under Qualifications. You can follow any responses to this entry through RSS 2.0. You can leave a response, or trackback from your own site.